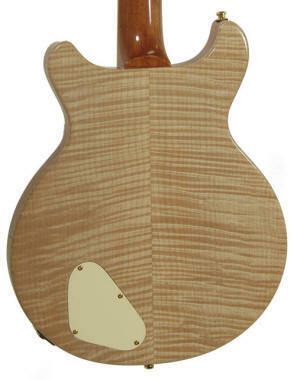 A bent top guitar is a guitar that has a totally artificial veneered archtop. It is yet another way for the bigger mega corporations to bilk more money out of uneducated consumers. Guitars with bent tops should be avoided if possible. Of course large corporations should also be avoided and there would be no need to look for these type of scams. The picture of the Brian Moore Guitar below appears to be an archtop, but if you look at the picture above it's plain to see the radius bent top. The wood around the top edge is fake, The top is actually paper thin. 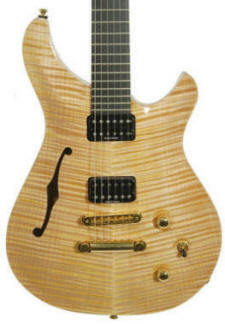 It appears to be an archtop when you look at it quickly. But be assured it is not an archtop. Its only a veneer illusion !!! A Carved Top is usually a thick piece of wood that is carved into an arch. It will always sound much better than a bent veneer top. 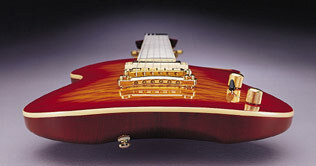 Quicksilver Guitars Are All Solid Wood True Archtops.